The Empire VFLL38FP30LN Boulevard Contemporary Linear Vent-Free Fireplace puts out over 38,000 BTUs using natural gas as fuel. At just 13 inches deep, and with a vent free construction, this contemporary fireplace can also be framed and mounted, creating a modern look. The manufacturer includes a 5 year warranty on the fireplace, and a 1 year warranty on the remote included with this package. Fireplace pictured with optional, separately-purchased matte black decorative front. Do you sell the Porcelain White Liners? While they are not currently offered on our site, these panels are indeed available. Is there an option to buy logs? What does it look like without the optional matte border? Does it come with a basic trim kit? Yes, there is an optional Blue Bay log set for this fireplace. There is no trim included in the surround, but no trim is required for installation. Please see photos of the unit with the log set option (pages 3 and 6) and without any trim/frame (page 2) here: Empire Boulevard Vent-Free Linear Gas Fireplace. No, this fireplace does not include nor does it have an option to add a blower. Most linear vent-free units like this do not have this as a feature or option. I would like one of these units built into a tv console book shelf. Is there such a thing? There are not such consoles listed as pre-built accessories, but you can definitely have a carpenter construct something following the minimum clearances to combustibles. The only units we have with consoles available are electric. While this does not come with a light kit, one can be purchased for it as an accessory. Unfortunately, there is no conversion kit for that unit. Is it possible for the insert to be installed without the front trim? Yes, this fireplace can be installed without the optional decorative frame as shown in the main image on this page. Does this have an oxygen depletion auto shut off? Yes, this vent-free fireplace does include an oxygen depletion sensor. No, there is no blower option for this fireplace. Please confirm the actual dimensions. It says it is 43 inches wide and the height is 35 inches high; this is nearly square, but the picture shows a more long and thin size. Please confirm the size. Thank you. The full dimensions can be found on page 15 of the product manual linked below: Manual. What is the weight of this unit? The maximum heat output and minimum heat output shows the same thing. Does this mean there is no adjustment of heat output? I am afraid of this putting out too much heat and of not being able to leave it on for long periods. 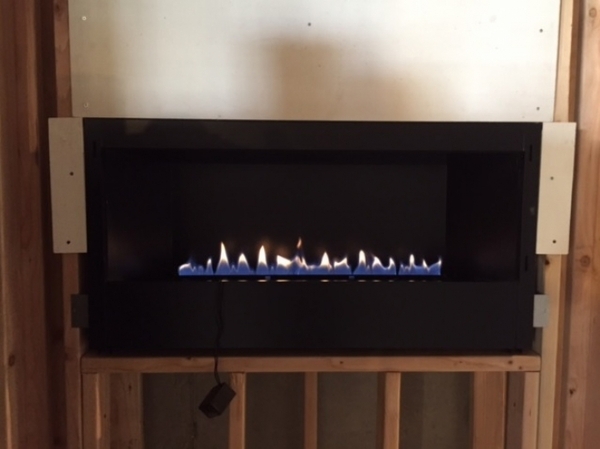 This fireplace weighs 87 pounds and the fireplace has a BTU output of between 25-32,000 BTU in natural gas and 23-32,000 BTU in liquid propane. Please note that ventless systems should never be left on for more than about 3 hours at a time and while the flame height is indeed adjustable with this model, the Hi/Lo knob may be difficult to access in order to make this adjustment. Plus, the included remote will only turn the burner flame off and on. Must this be inserted in a wall or can a cabinet be built for it? If the proper framing dimensions and clearances are maintained, a mantel cabinet could indeed be built for this unit. Is this fireplace approved and safe for installation on a covered patio? No, this fireplace is not suitable for use outdoors. Is the 4" cover designed to be flush to the wall? It can be installed either way. Can I get a link to the manual for the Empire VFLL38FP30LN Boulevard Contemporary Linear Vent-Free Fireplace? This manual is located here, but may also be found directly below the main product photo on the item page for this fireplace. If there a fireplace fan available for this unit? This unit does not have an available blower. Does this fireplace come with a propane tank? This unit does not come with a propane tank however it can be connected to a propane tank. Does this fireplace come with a glass front or is it open without glass? Although rare for a vent free design, this model does indeed utilize a panel of glass over the opening. Can this Empire vent-free fireplace be mounted under a TV? This is possible, so log as the mantel clearances provided on page 26 of this installation manual are followed. Can I mount a TV above this Empire fireplace? While this can be done, we recommend either recessing the television at least 3"-4" back into the wall above the fireplace or installing a mantel shelf above the fireplace (per the manufacturer's clearance requirements) and then the television to be installed above the shelf, at least 2-4" behind the projection of the shelf. Can this Empire VFLL38FP30LN be enclosed in stone so that all you can see is the linear opening? Yes, this can be done as shown in the digital brochure. What are the dimensions of this Empire VFLL38FP30LN Boulevard Contemporary linear vent-free fireplace? This fireplace has outside dimensions of 43 1/3" wide, 21 1/8" tall and 11 1/2" deep. The viewing area inside the firebox is 38 1/4" wide and 12 1/16" high. This fireplace is really pretty..easy to order. Customer service was great. Prices are very good. Great price and excellent help! Appreciated the time Tyler took with me. Pricing was great and with free delivery. Bought the same unit more than a year ago but got a better price with eFireplace Store this time. Thank you! Fantastic experience. Saved a bunch of money.